A recent post on a social news sharing website caught our attention. 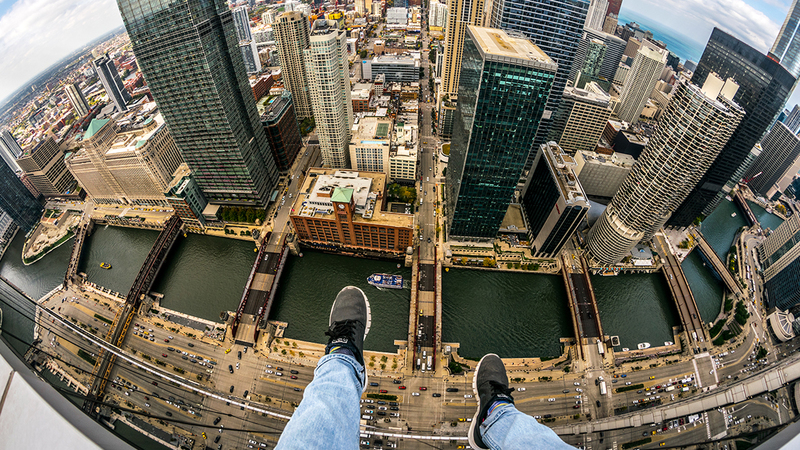 In the image, a pair of legs dangle above the Chicago River, seeming to float above Wacker Drive as cars, buses, boats and barely visible human specks make their way in orderly east-west and north-south fashion many, many stories below. The precipitous position of the legs and their carefree nature – they appear to be mid-swing and somehow wholly unconcerned about their place on this grid – is both shocking and appealing. How did this happen? What’s that person doing up there? And also: Wow – that’s an amazing shot. We had to find out who was behind the lens. Andrew Fitzsimmons is 18 years old. He’s a college student in Iowa. The self-professed “rooftopper” scales tall structures for fun in three Midwestern cities. In addition to Chicago, he does this in Des Moines and Minneapolis. Rooftoppers eye skyscrapers and other tall structures like construction cranes – Fitzsimmons tells us he’s no stranger to these – as obstacles to climb and conquer. The practice is a type of urban exploration, the act of venturing into abandoned or blighted structures to take photos or simply satisfy one’s curiosity. Of course, all of this comes with a lot of physical and legal risks, and while we're curious about it, we don't endorse this behavior. For example: In 2012, a 23-year-old man died after falling down a smokestack on the roof of a 42-story hotel on Michigan Avenue. The man was exploring the roof with a friend and taking photographs, according to a Chicago Sun-Times article. Given the risks, why (and how) does Fitzsimmons do this? We called him up to find out. Chicago Tonight: How long have you been doing this, and what got you started? Fitzsimmons: My first building would have been when I was 14, I think. I’ve always been interested in photography. I’ve been doing it my whole life. I was looking online one day and I saw these rooftopping pictures and they looked a lot better than any other photography I’d seen. So I decided to teach myself how to do it. If they can do it, I can do it. So I decided to try to do it on my own and I came a long way from there. CT: Do your parents know about this hobby? If so, how do they feel about it? Fitzsimmons: Yeah. At first when I started doing it, they didn't know and then when I started showing them pictures, my parents were pretty concerned. I mean, I'm sure any good parents would be concerned if their son was doing stuff like that. But they've kind of grown to realize that, you know, I'm not going to kill myself up on these buildings. They've come to accept it, more or less. CT: How many rooftops would you say you’ve climbed so far? Fitzsimmons: I have no idea. A lot. I’d say around 30 to 40. CT: Why do you do it? What compels you to do something so dangerous? Fitzsimmons: Well, it might sound crazy, but the adrenaline rush. Being on these buildings and seeing these views – it feels really freeing. CT: Do you have a favorite building that you’ve climbed? Fitzsimmons: Well, I can’t really give out specific buildings. You could tell from the pictures, but I can’t really give out specific buildings. Fitzsimmons: Because, you know, if you tell everyone which buildings they are, more people will try to go on them. And then there will be stricter security at the buildings and then I won’t be able to go on them anymore. CT: What’s the highest altitude you’ve reached? Fitzsimmons: I’d probably say around 70 floors. CT: How do you normally access buildings? Fitzsimmons: Rooftopping is illegal because it’s trespassing. You have to be sneaky in how you get into and on top of some buildings. A lot of them are apartment buildings where you have to pretend like you’re a resident. If you’re climbing a construction crane, you wear a hard hat to avoid suspicion. There’s lots of different ways – it depends on what you’re trying to climb. CT: That almost sounds like it’s straight out of a movie. Have you really worn a hard hat to sneak into a site? Fitzsimmons: Yes, for construction cranes. They have these enormously tall cranes and at night, they’re not doing construction, so a lot of these sites are completely unguarded. You can basically go to the crane and climb it all the way to the top. CT: Have you ever been injured or had any life-threatening close calls? Fitzsimmons: Not really. Sitting on the side of a building might look unsafe, but essentially it’s the same thing as sitting on a chair. It’s not like you’re going to just randomly fall out of the chair. It’s relatively safe. CT: Have you ever been arrested or gotten into legal trouble? Fitzsimmons: Many times security has come up and said, “You can’t be up here. What’re you doing up here? The police have been notified,” but I’ve never been arrested for it. I’ve been banned from buildings and premises. They’ve taken pictures of my face and said, “If you ever come back here, we’ll call the police and arrest you.” There have been lots of close calls in that way, legally. You can’t do it if you’re really worried about having something on your criminal record, because odds are, it’s going to happen at some point. CT: Do you normally go alone? Fitzsimmons: It depends. I’d say half the time, I’ll go alone and half the time, I’ll bring someone with me. CT: How do you prepare? Fitzsimmons: I get the camera equipment together and do research online, like looking at Google Maps. I have a plan for what I’ll do and what buildings I’ll get on top of beforehand. CT: Do you have any fear when you get up there? Fitzsimmons: [Laughs] In the beginning, I definitely did, but now I’d say I’m overwhelmed with excitement more than anything else when I get on top of a building. I’m just happy that it paid off. It is dangerous. People have fallen. People have died. People have gotten arrested. You have to keep that in mind. You have to make sure that you’re being safe on top of the building so you don’t accidentally kill yourself. CT: I imagine wind is a serious danger when you’re up that high, right? Fitzsimmons: That’s one of the scariest things when you’re on top of a building. When you feel a sudden gust of wind hit you and you have to float back for a second. That will get your heart rate up real quick. CT: Have you experienced moments like that? June 17: Rick Drew has been exploring and photographing abandoned sites in and around Chicago for a decade. But the hobby is considered by some as simple trespassing. Feb. 9: After reading about people living in tents on a large plot of abandoned property along the Chicago River, I grabbed my camera and set out for the South Loop to investigate. July 9, 2014: Three local friends routinely visit abandoned industrial sites in the Midwest, enter the buildings, and take only photos. They don’t carry crowbars or anything that might attract the attention of the police.